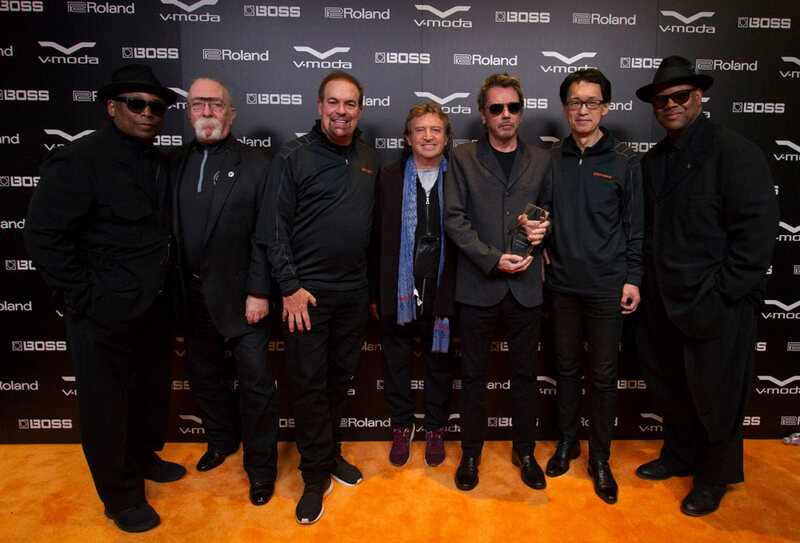 Left to right: 2016 Award Recipients Terry Lewis and Jeff “Skunk” Baxter; Jay Wanamaker, Roland Corporation North America president and CEO; 2017 Award Recipients Andy Summers and Jean-Michel Jarre; Mr. Jun-ichi Miki, Roland Corporation CEO and Representative Director; and 2016 Award Recipient Jimmy Jam. At the 2017 Winter NAMM Show, Roland and BOSS presented lifetime achievement awards to Andy Summers and Jean-Michel Jarre, two monumental figures in modern music history. The annual awards recognize individuals for their invaluable contributions to the music industry while using Roland and/or BOSS gear throughout their careers. Previous recipients include Jimmy Jam, Terry Lewis, and Jeff “Skunk” Baxter.